Q. What could I use custom Seedboms for? Our custom Seedboms make the ideal giveaway, corporate gift, promotional product or favour. Seedboms are compact and light for sending and something totally different………..beats a pen or a usb drive! Our minimum order is 50 units (wraparound digital print style), 100 units (standard digital print) and 500 (standard litho print). Q. How long will my custom order take to arrive? Typical orders take 1-2 weeks to arrive after proof approval. Larger orders (+500) can take 2-4 weeks. We send all orders as soon as they are ready via courier next day delivery. £10.00 (UK mainland) or free delivery if order costs £200 or more. Orders delivered out-with the UK (Europe only) are quoted on request. Q. I wish to design the sleeve myself, what is the file format? We work in Illustrator and Indesign. We can also accept Photoshop files providing the artwork is minimum 300dpi. Q. I'd like you to design my sleeve, how do we do that? Have a conversation with us to discuss your needs. Ideally you would send us your design requirements i.e colour choice, logos, text etc. We can help you with all the details and design something to suit your needs. Q. 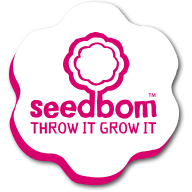 We'd like to have Seedboms for my Wedding, can you help? We can indeed. We have a Seedbom Wedding range of 4 distinctive styles you can customise for your big day. You can find all the details here.